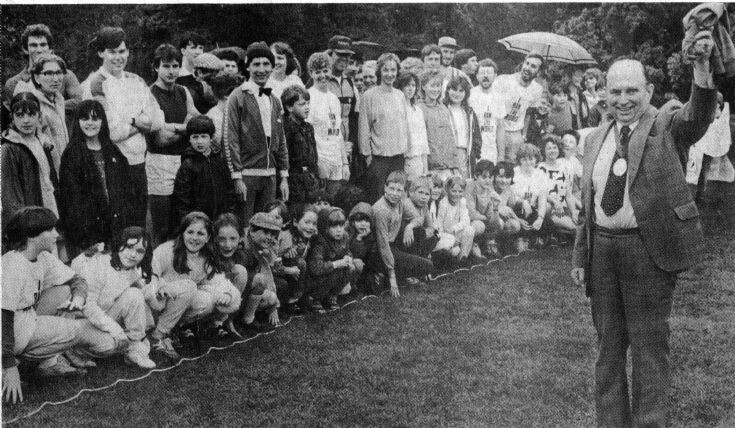 In June 1986 a fund-raising event took place in Handcross which involved about 100 residents of Handcross jogging three-miles around the Hyde Estate. It was organised by Mrs Vivienne Young in aid of famine relief and local charities. First to complete the three miles (4828 metres) was Duncan Thompson within 20 minutes. I think he was going a bit faster than jogging; but still somewhat short of the current world record for 5000 metres in 12 mins 37 secs by Kenenisa Bekele of Ethiopia! The starter was Roger Ray wearing his badge as Chairman of the Slaugham Parish Council. Unusually he waved a jumper instead of the more-usual flag, or indeed firing a starter pistol! Select Open Document to view the newspaper cutting.